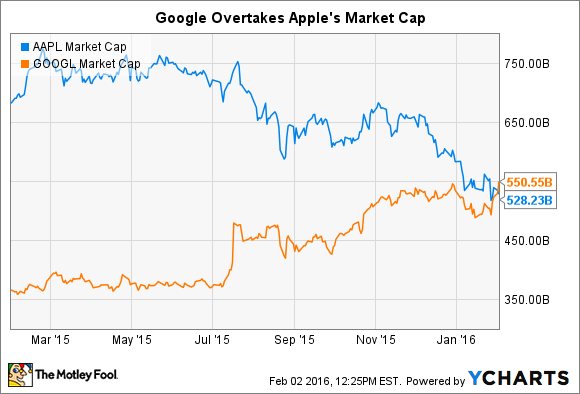 Alphabet may have a larger market cap than Apple, but Apple's profits are more than three times Alphabet's. On Monday afternoon, following Alphabet's (NASDAQ:GOOG) (NASDAQ:GOOGL) better-than-expected fourth-quarter results, a rise in the company's stock price during after-hour trading clearly indicated the company would surpass Apple's (NASDAQ:AAPL) market capitalization on Tuesday morning to overtake the iPhone maker, and take the title as the world's most valuable publicly traded company. And this is exactly what happened. Alphabet's market cap now sits at about $526 billion, slightly ahead of Apple at about $524 billion. With the two companies now neck and neck when measured by market cap, it's a good time to compare them on some key metrics. Will their score on paper explain why the market is awarding Google a more-valuable market cap? Measured by recent performance over the past 12 months, Apple looks like it would deserve a premium valuation to Alphabet -- at least on paper. Not only did Apple rake in more than three times the net income of Alphabet during this period, but it also grew its EPS twice as rapidly as Alphabet. Clearly, the market expects Alphabet to be able to grow its business more sustainably over the long haul than Apple. Alphabet's price-to-sales and price-to-earnings ratios of 7.3 and 32.2, respectively, signal the market's confidence in its upside potential. Comparatively, Apple has P/S and P/E ratios of 2.3 and 10.2, respectively. Why is there such a gaping discrepancy in these two companies' performances during the past 12 months, as well as their valuations? It becomes clear when you compare the two companies' most-recent quarters -- which the market seems to be convinced are more indicative of where they are each headed -- as well as factor in some narratives on the two companies' current situations. Here's how Apple and Alphabet performed in their most recently reported quarters on a few key metrics. When it comes to the top line, which investors may believe will be a critical driver of Alphabet's EPS over the long haul, Alphabet's revenue growth in Q4 of 18% was greater than its full-year growth of 13.5%. Further, Alphabet's non-GAAP EPS, which the company believes gives investors the best picture of its business performance, was up an impressive 28% compared to the year-ago period, easily trumping Apple's 4% year-over-year growth in GAAP EPS. Further, adding to the comparatively more-negative market sentiment toward Apple's growth prospects, Apple is guiding for negative year-over-year revenue growth for its current quarter. In contrast, while Alphabet doesn't share guidance, negative revenue growth for the online search company is very unlikely any time soon. Finally, Google's advertising-dependent business model is simply subject to less volatility than Apple's. With Apple generating more than 60% of its revenue from a single product category, any time iPhone sales growth comes to a halt, the market may worry that the company's revenue is peaking. This is exactly what the stock is priced for today as investors question whether Apple can continue to grow sales. Investors are ultimately rewarding Google with a higher premium because the company has a more predictable future than Apple. But if Apple manages to surprise investors in the coming years, and proves that its current levels of revenue and net income still have room to run, the stock could be drastically underpriced at this level.